A UK Athletics qualified Coach in Running Fitness Hannah has been supporting people with their running since 2015. 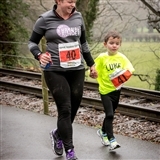 Having only discovered a love of running in her late 30s Hannah understands the mental and physical challenges of being a beginner or pushing outside your comfort zone. In her coaching Hannah strives to be friendly and approachable: a non-scary running coach, but she's not afraid to dispense tough love when you need it! In her free time Hannah loves muddy trail running and she completed her first and second marathons (both off-road) in 2017. Hannah has set herself a challenge in 2018 to run a race every month.